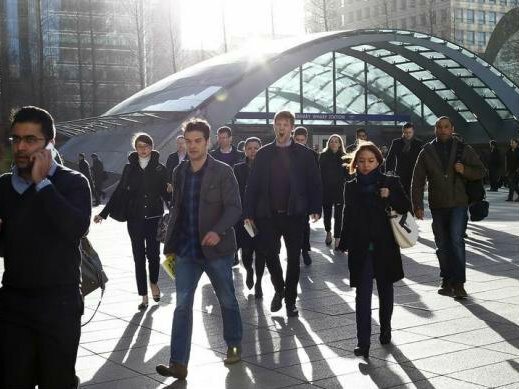 LONDON (Reuters) – A talent shortage in Britain’s financial services and technology sectors has pushed salaries in the industry up by 2.6 percent in the last year, ahead of inflation and outpacing sluggish UK wage growth, research showed on Thursday. Hiring across finance and accounting, financial services, information technology and administration has returned to pre-recessionary levels, with demand for staff far exceeding supply as businesses start to target growth as well as efficiency, according to the 2015 Robert Half Salary Guide. In financial services, 97 percent of executives surveyed reported challenges in finding candidates with the right skills. Phil Sheridan, senior managing director at specialist finance and accounting recruitment firm Robert Half, said the best candidates have received multiple offers and counteroffers. “It is therefore crucial that the remuneration companies offer is competitive with other businesses in their industry and region,” Sheridan said. Banks including HSBC have complained that a new European Union cap on bonuses could add to difficulty in recruiting staff. Many banks introduced “role-based” allowances to counter the cap, but European regulators have said that they constitute variable pay and may need to be restructured. But Robert Half found that money is not the only thing on employees’ minds. Many are also looking for other benefits and perks, such as flexibility in their work-life balance.